Have you checked out Touratech Closeouts? This video takes a comprehensive look at the key features of the Plug and Travel Suspension System and gives critical insight into the elements of motorcycle suspension. If your current suspension feels spongy, worn out, too soft, or just not up to the task, it’s time to replace your shocks with Touratech Plug & Travel Dynamic suspension. 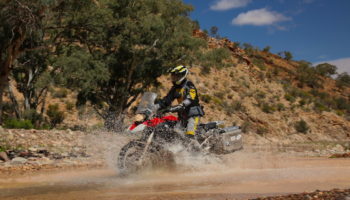 Upgrading your suspension is the single biggest improvement you can make to your R1200GS or Adventure. The world’s first plug & play suspension system for the water cooled R1200GS or ADV with dynamic suspension, Touratech Plug & Travel fully integrates into the stock wiring system, giving you all the same controls and adjustments you’ve grown to love. On top of that, Touratech suspension adds high and low speed compression damping adjustment along with many other features that will ensure your suspension takes you the distance no matter what the load or terrain.